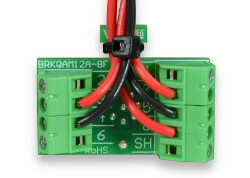 These M12 breakout boards are part of the BRKQ series, which provides a clean and simple solution for terminating wires at a connector through a panel or enclosure wall. These boards are great for making machine network connections, connecting external sensors, connecting human interface devices, and neatly transitioning cabling through an enclosure. This board has an 8-pin, A-coded M12 connector that brings all eight lines out to screw terminals. It is available with either a male or female connector. A breakout board is sometimes referred to as a "transition module", "terminal board", "terminal block", "breakout box", "breakout adapter", "terminator", or "interface module". 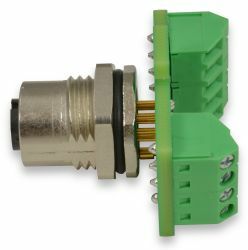 This board comes with an M16 panel nut installed on its connector. This nut is used to secure the board to a panel or enclosure wall. Simply unscrew the nut from the connector, insert the connector through the wall, and reattach the nut to the connector. This board also has a strain relief feature that eases the tension placed on wires connected to the terminal. To utilize this feature, simply wrap a cable tie (sold separately) around the strain relief extension and close it over the wires that populate the board's terminals. These thin cable ties work very well as strain relief on a variety of Winford breakout boards, including boards in the BRKQ series. They are a great choice for tying both small and large wire bundles to the breakout boards.